This entry was written by Vera and posted on December 25, 2007 at 3:44 and filed under Thailand, World Trip. Bookmark the permalink. Follow any comments here with the RSS feed for this post. Both comments and trackbacks are currently closed. een goedgezond heid in 2008. 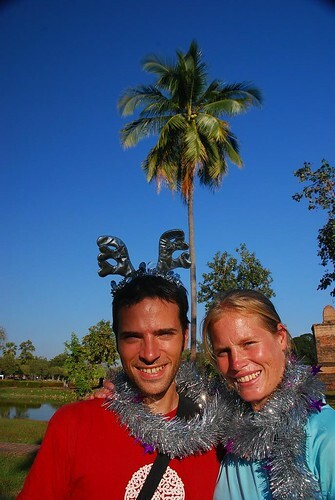 Thinking of you two celebrating Christmas in a non-Christian country! Unusual experience to be part of a minority religeon? Hope the good times continue in 2008! @Leonard: Actually, Christmas is very far from us here, although we treated ourselves to some “Christmas-treats” yesterday: a really delicious dinner and one hour of Thai massage. Nous sommes légèrement jaloux du bronzage que vous arborez sur cette photo, mais continuez quand même de bien profiter de ce voyage inoubliable! I read all your stories and am always excited about the things u r going through. I hope you will stay healthy and keep your good humor ! @ Dany : merci pour ce gentil message ! Il faisait effectivement un peu plus chaud, mais la temperature tombe sous les 20 la nuit maintenant. Bonne annee a toi ! @ Jurgen: Thank you, we wish you the same to you. We spent NYE simply in a good restaurant and in company of Thais in the street of Chiang Mai. It was a nice and wonderful experience! Hallo Vera…wishing you and your Jean a very nice year 2008…with lots of fun and adventures…Niklas and I are going to have holidays in Hawaii at the end of january…I will tell you more when we are back! Hallo Vera en natuurlijk ook Jean-Christophe . Ik kreeg je adres van je zusje via Hyves . Mega top , die wereld reis !!! Ik weet niet of je me nog herinnert , ik was een vriendin van je op de basisschool ! Het gaat dus goed met je , met mij ook hoor , just an ordenairy live…. maar wel een goed leven hoor . Lieve vriend , leuk huis , schat van een hond . Maar hoe kom je op dit idee en waar heb je Jean-Christophe leren kennen ???? It was wonderful meeting the two of you in Chiang Mai! We have just emerged from trekking and were able to check in on your progress. Love the site!